Smoke show! 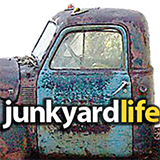 The boys from Junkyard Life get called out for not doing burnouts. Keith Lively and his all-wheel-drive 1966 Chevy Impala built on a 2004 GMC Denali chassis are up to the task. Chained to our custom TJ "Money Burner" Jeep Wrangler with 1-ton axles, 6.0 liter LS engine and 4-doors, the Impala let them rip. Smoky burnouts for everyone! Afterwards the junkyard-style 1973 Pontiac Grand Am, owned by Jody Potter and driven by Ron Kidd, with the 400-V8, posi equipped laid some stripes. Then, Keith and Ron get a laugh discussing the merits of Lively’s rubber burning abilities. Enjoy the show! And... Do Not Try This At Home!!! The gang loaded up and headed to Bowling Green, Kentucky in these two car for the start of the 2018 Hot Rod Power Tour. More road trip tales are coming soon.